Eogyrinus. Computer artwork of Eogyrinus sp. 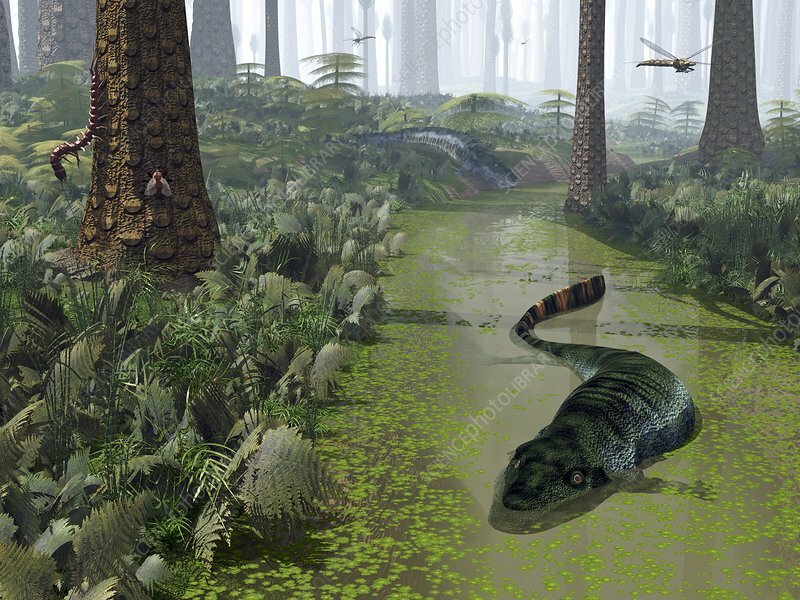 prehistoric amphibians in and around a forest stream 300 million years ago in what is now western Europe. At 4.5 metres long Eogyrinus was one of the largest predators of its time. It probably spent most of its time in the water, and like modern crocodiles probably fed on fish and other swimming vertebrates. Also seen are a giant millipede and cockroach on the trunk of a Sigillaria scutellata tree (at upper left) and dragonfly-like prehistoric insects from the genus Meganeura.